I do love my instant pot but I also have the same fondness for a sheet pan dinner. Really it's the same concept. Instead of loading everything in the instant pot, I just wait for the oven to heat up and toss everything on a cookie sheet. 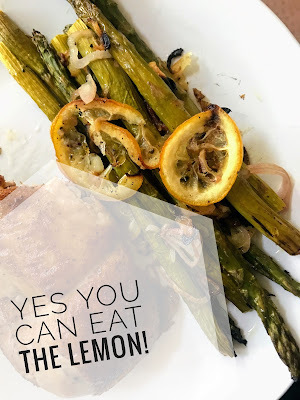 Since asparagus is coming into season let's celebrate that with a super simple and easy dinner. Wash your Asparagus and chop off the woody ends. Set aside. Pat dry your chicken and dump into your bowl. Drizzle with 2 T of olive oil and 1/2 t of smoked paprika, 1/2 t salt, and 1/4 t pepper. Toss well to coat. Place chicken on the aluminum foil covered cookie sheet. Arrange the asparagus around the chicken. Finely slice the shallots. Sprinkle the cut shallots over the chicken and asparagus, and drizzle the shallots and asparagus with olive oil, salt, and pepper. Now slice the lemon into rounds. Top everything with the lemon slices. Cook on the center rack of the oven for 30 minutes. While everything is cooking, take your grocery store olive blend and roughly chop the olives. 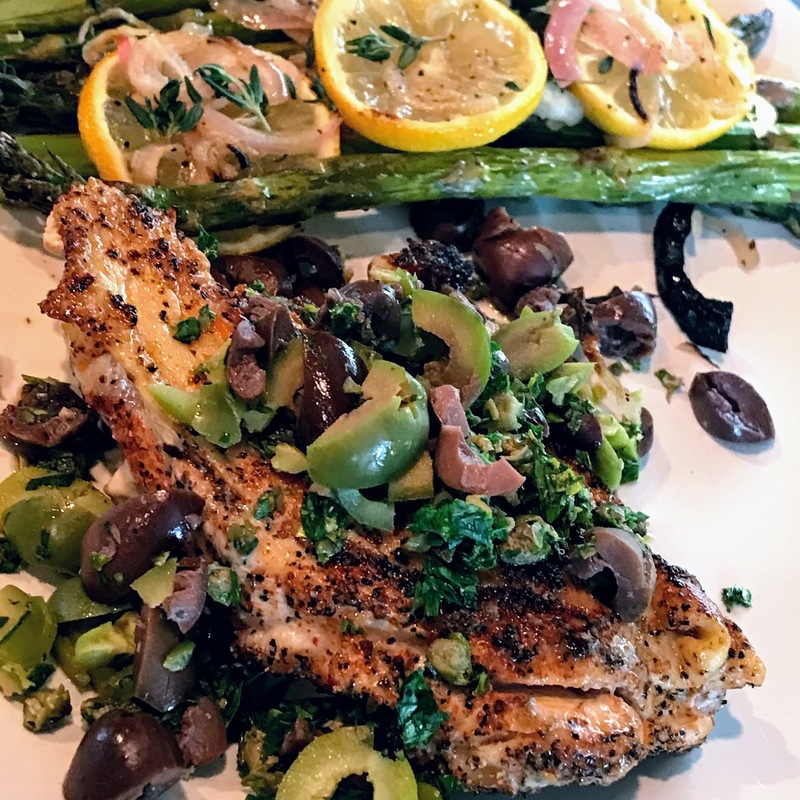 When the timer goes off, top the chicken with the olive tapenade and serve immediately. Nothing worse than cold asparagus! If you are reading this on your phone and you are home, walk into your bedroom. If you're not at home picture your bedroom. Can you instantly see or think of one or more things that need to get done but you just haven't done them? I have jewelry I need to find a home for, a painting that needs to be stored until next winter, and a bookcase in desperate need of styling...or at least the cords hidden for Pete's sake. It doesn't matter that I finally got my cord keeper mounted and organized on the back of my nightstand, or I finally hung artwork that I received as a gift on the wall. I don't think of what I've accomplished, I think of what I haven't, and that's called the Ziegarnik effect. More on this psychological theory here. 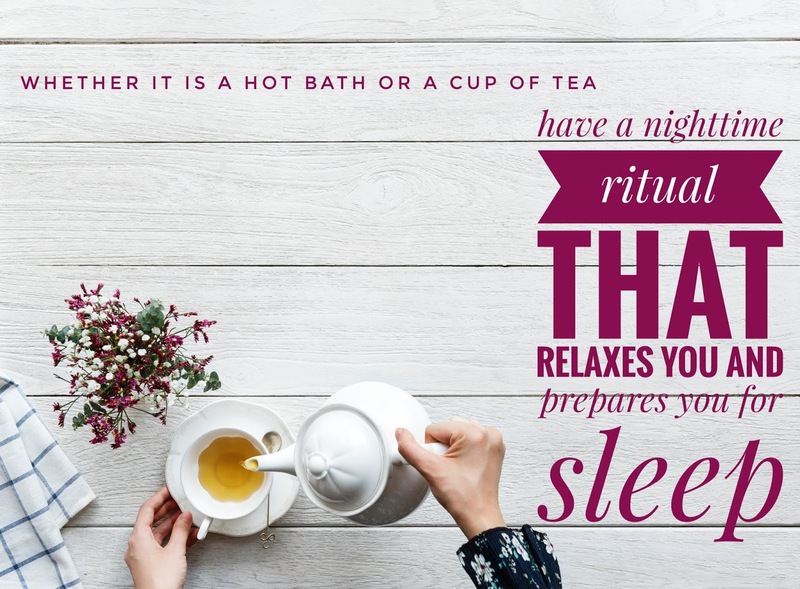 Over the next few weeks, I'm going to challenge you to do 1 to 3 things in each room and then see how you feel mentally (and even physically) when you get those things off your plate. So the above pictures are my before photos. As always I will document my mental state. Today...gee I'm doing a Whole30 and it's kill all the things days. LOL! Well, we will see how I do. Yes, I do feel really good when I crawl into bed at night. It's finally finished and even #leohusband said it looked really good. I almost fainted! This coming from him is a real compliment. Ardha Chandrasana is one of my favorite poses. Don't let the fact that you are balancing on a leg scare you from trying this amazing pose. Half Moon strengthens the thighs, ankles, glutes, core, and spine. While you are strengthening you are also stretching. The hamstrings, calves, chest, shoulders, spine, and groin are all opening and lengthening. This asana also helps you work on your balance and focus and gives you a sense of better coordination. Since your head is usually below your heart it is also a stress reliever. It can help with menstrual pain, leg pain, and back pain. 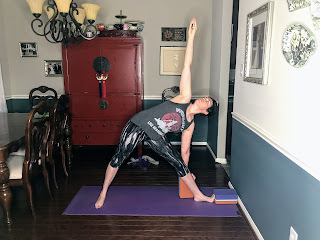 Those three items are why it's worth it to include this pose in my weekly practice. 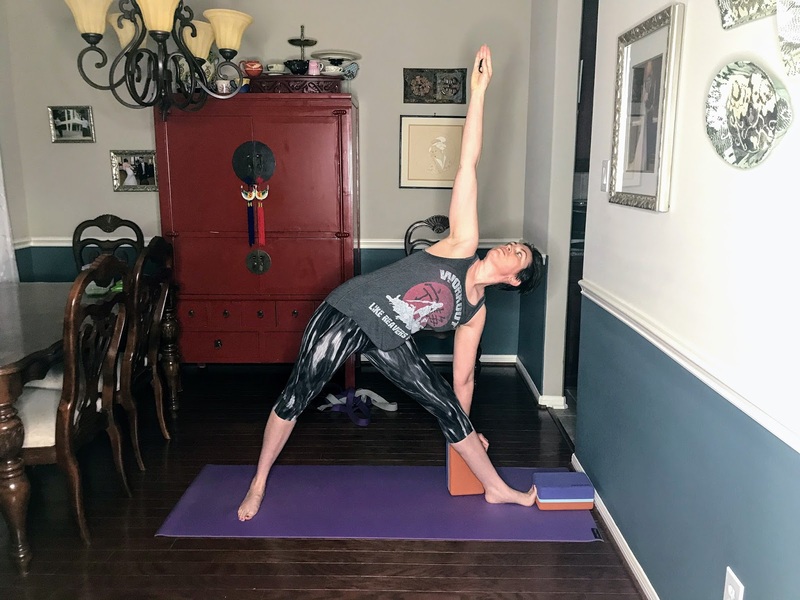 I hope you've been practicing your Virabhadrasana II and Trikonasana because these two poses help you prepare for Ardha Chandrasana. I have a hard time remembering and keeping track of stuff. Let's face it with chronic pain and illness our mental capacities are not what they used to be. So much stuff is just stuff, so it really doesn't matter in the grand scheme of things to a person with a chronic condition, except when that stuff starts to make you sick. So when we moved into our house (a terrible experience for first-time buyers, it haunts us and probably why my husband is reluctant to move closer to his office) we didn't get any documentation from the previous homeowner. No books on the water heater, nothing on the oven or dishwasher, and certainly nothing on the ac unit. So it came as a complete surprise that we had an internal air filter in the unit that we were supposed to replace annually. Whoops! I won't tell you how old and nasty this thing was. No wonder I kept getting sick. Ugh! I will be honest. We definitely don't replace the individual filters as often as the recommended three months on the package. We do four months. I buy them in bulk and doing every four months instead of three gives us two years of the bulk buy. Hey, one month isn't going to kill us. So when should you replace your toothbrush? When should you think about getting new carpet? 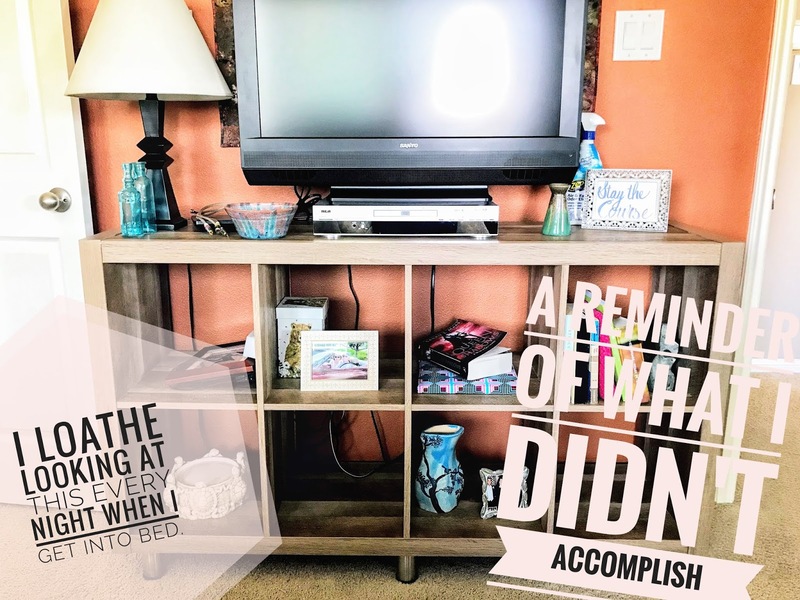 Well, I did the research for you and made a lovely bullet journal collection so I can keep track for myself what has been done in my house. I'm on a kick to increase my energy. As I discussed a couple of weeks ago, chronic pain and illness has a nasty side effect, fatigue or as I like to call it IUEV. Last week I focused on three supplements to increase your energy. This week I'm focusing on amino acids. 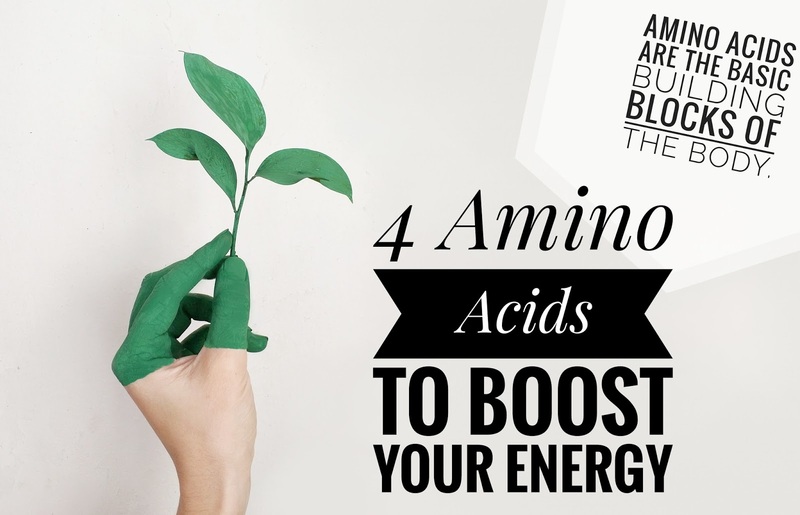 Amino acids are the basic building blocks of the body. They are also sources of energy, like fats and carbohydrates. Supplementing with the right amino acids can boost deficient brain chemicals and make transitioning to a healthy lifestyle more achievable. In chronic pain and illness terms, it can help lead you back to a more balanced life. 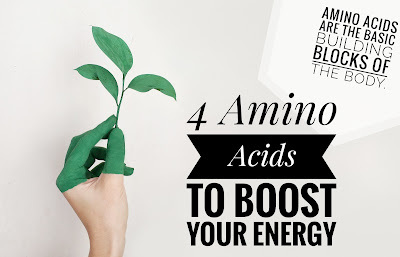 This amino acid is a precursor of adrenaline, dopamine, and norepinephrine, which are important for maintaining a sense of well-being and energy and also promote a healthy metabolism and nervous system. Tyrosine also works with iodine to promote thyroid health. Supplemental L-tyrosine is excellent for treating fatigue, low moods, depression, and anxiety. Dosage begins at 500 mg, one to three times daily. Increase dosage as needed, up to 2,000 mg three times daily. Your kidneys convert ornithine into arginine. Arginine is a precursor for a compound called nitric oxide, which helps dilate your blood vessels when you require extra blood to your tissues. Arginine also helps your muscle cells produce creatine, a compound they need to contract. Research suggests that consuming extra ornithine can help promote physical strength and endurance. For example, a study published in the November 2008 issue of "Nutrition Research" found that healthy subjects who took extra ornithine experienced less exercise-induced fatigue than a placebo group. The authors concluded that ornithine promotes more efficient energy usage by cells, and they recommend it as a nutritional supplement to prevent fatigue. L-ornithine supplements are generally considered safe, although no minimum effective dose has been established. As discussed above, L-arginine has multiple benefits, including improving immune function, fertility, detoxification and brain power. Another important aspect of L-arginine is that it stimulates the production of certain hormones, especially beneficial growth hormones and insulin that help usher glucose into cells to be used for growth and energy output. This is one of the reasons it’s believed to enhance physical performance, stamina and strength. Dosage begins at 500 mg, one time daily. Increase dosage as needed, up to 1,000 mg three times daily. Carnitine is good for a number of conditions, it is a good energy booster, antioxidant and a mood and cognitive enhancer. Since younger healthy people have a sufficient amount of carnitine in the body it does not have as great of results as in older people. In older people or people with chronic conditions, carnitine improves body composition. However, it may improve exercise endurance in all ages by increasing muscle carnitine levels. Initial studies have found that dietary carnitine stimulates the break down of fats into energy, reduces the amount of lactic acid produced during exercise, speeds up recovery from exercise stress, prevents cell damage, and prevents cell death. This may contribute to weight loss.Just as carnitine’s ability to produce energy from fats can help boost your endurance to exercise and lose weight, it can also fight fatigue. Dosage suggestion 1,000 mg daily. Glutamic acid, which is derived from glutamine, is essential for ideal brain function. During times of stress, your body uses up mass amounts of glutamine that can easily be replaced with a supplement of L-glutamine to keep you functioning at your best. Glutamine is also highly effective at fighting sugar and starch cravings. In addition, glutamine is also used to aid muscle recovery when taken before or after exercise. Suggested dosage is between 500-1,500 mg up to three times daily. Getting more fish in my diet isn't hard or tricky, I just feel that fish is very one note. There isn't much to do other than steam it in parchment or bake it. It's just not something I think about when I'm putting together my weekly menus even though I know I should eat more of it. 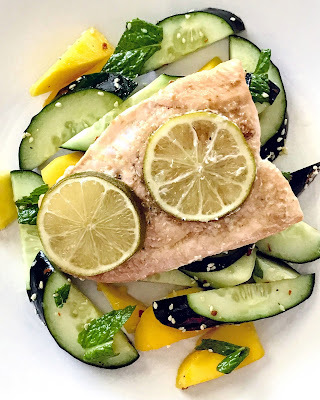 So when we tried Sun Basket's Paleo Meal Delivery, I loved that it had one to two fish recipes a week. Luckily, my fish horizons have now been expanded. As a chronic pain warrior, I like things fast and this is fast. Large filet of WILD CAUGHT salmon or 4 pieces, whatever is cheapest. Preheat oven to 400. Pat dry salmon and salt generously. Sprinkle with pepper to taste. In a small bowl whisk together 2T of olive oil and 2 teaspoons of ground ginger. Drizzle on the fish. Place the slices of lime on top. Put fish in the center of a parchment piece large enough to bring up and fold into a packet. 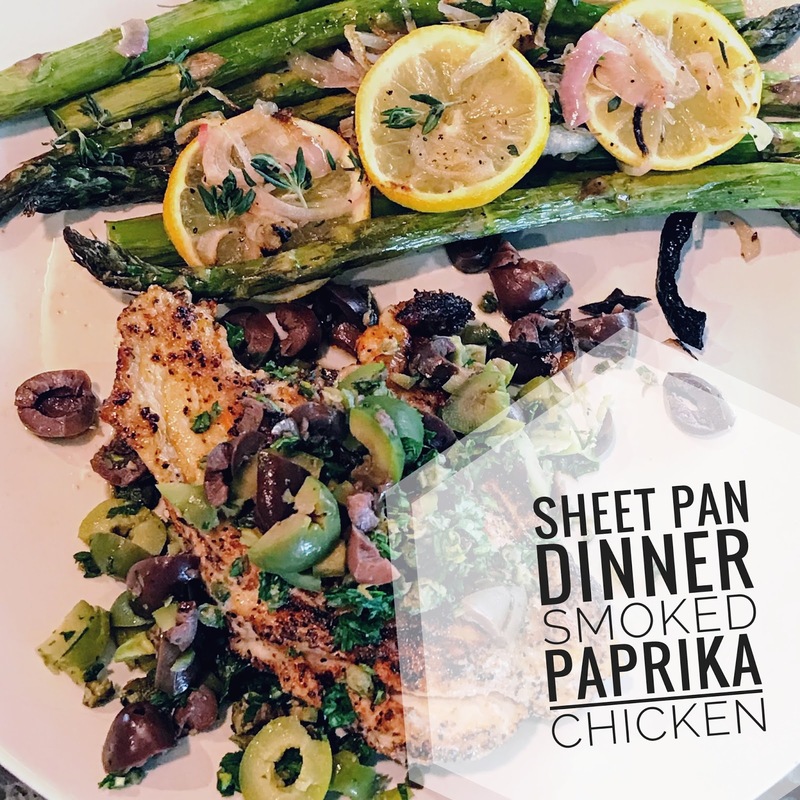 Place on a cookie sheet and put into the oven for 10 - 12 minutes. 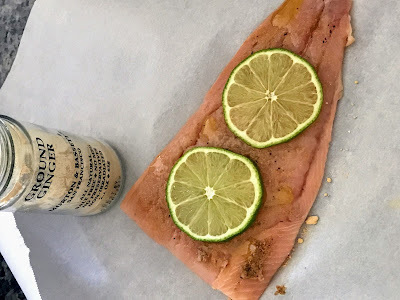 Bring up long sides of parchment paper, hold even and start folding the pieces together downward toward the fish. Crease well. Fold each short end in toward the fish. Meanwhile, wash the cucumbers and mint leaves. Cut the cucumbers into quarters lengthwise. Cut each quarter into chunks on the diagonal. Add to the large bowl. Open the mango. Chop up any large pieces to approximately match the same size as the cucumbers. Add to the bowl. Strip the mint from the stems and chop roughly. 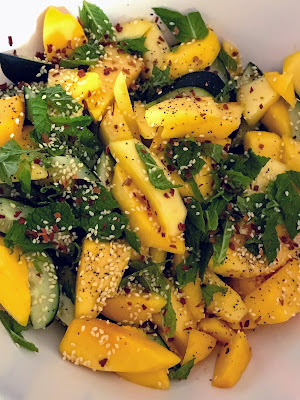 Add to the bowl along with the lime juice, 1 t of sesame seeds, 1 T of olive oil, salt, and pepper to taste, as well as the red pepper flakes to taste. Serve the salad with the fish. Fish is done when it flakes easily with a fork. 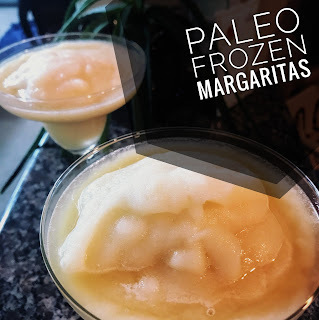 Sometimes treating yo self is not about eating delicious, yummy, melt in your mouth paleo goodness. Sigh. 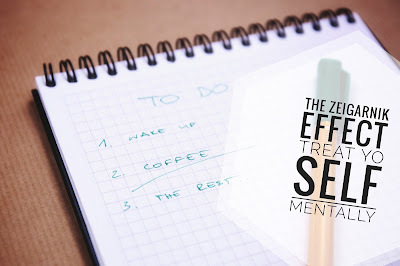 As I willingly roped myself and a good friend into a last-minute Whole 30 for the next month, I'm going to spend the next few weeks talking about treating yourself mentally...by clearing out some of those tasks that keep rolling around your brain. Zeigarnik effect is in force when an episode of a TV series ends with a cliffhanger leaving the audience in suspense until the next episode. Psychologist Bluma Zeigarnik’s research showed that the human mind hates unfinished tasks. Zeigarnik theorized that incomplete tasks incite “psychic tension” in you, which can be a persuasive impetus to complete the task. As long as you leave the task unfinished, your brain is in an uncomfortable position. Thoughts of the task serve to remind your brain of what it needs to do to get “comfortable” once again. As soon as you complete the task, this tension is alleviated, and in so doing, your brain lets the mind to release thoughts of the task from consciousness. 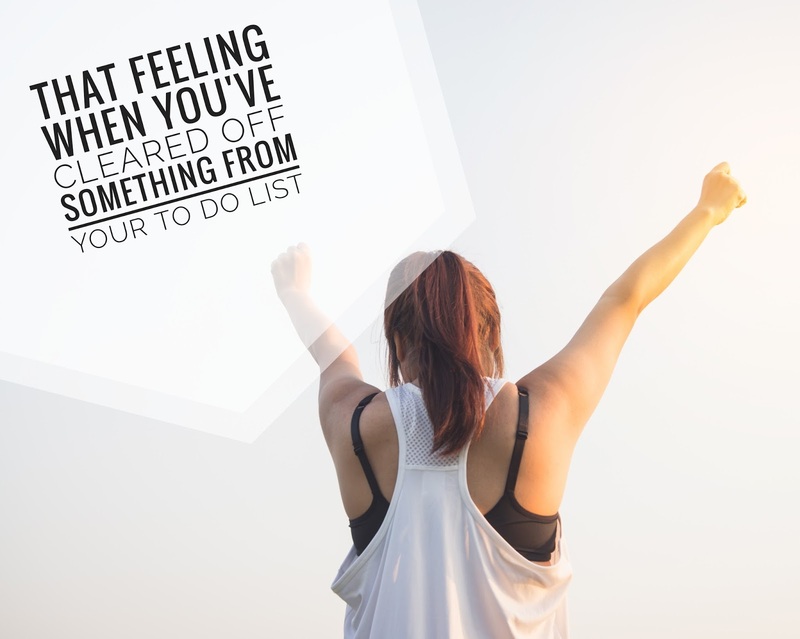 All those lists you have that have never gotten done, your brain keeps up with them even if you think it doesn't. So let's roll up our sleeves look around our living spaces because let's face it, as chronic pain warriors, we're mostly homebound. 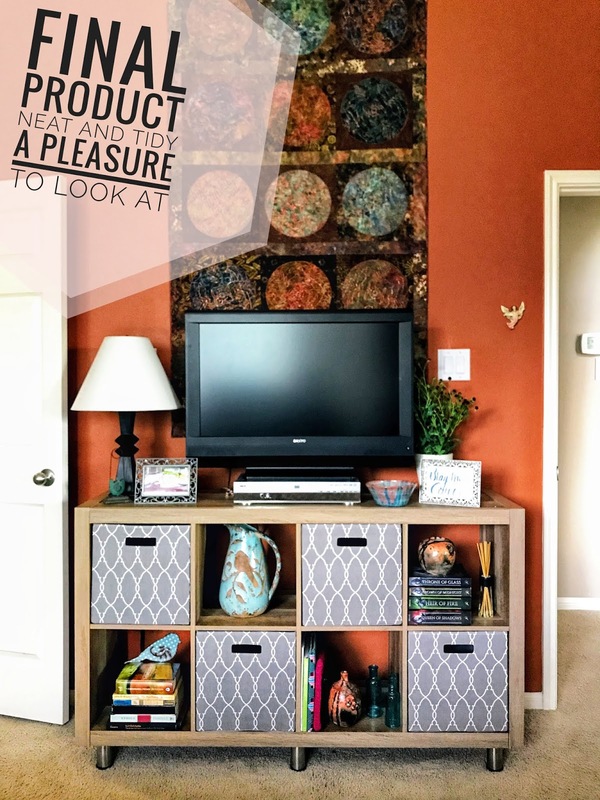 Getting some of these tasks done will not only help our mental attitude but make our space more enjoyable to be in. Something I think we can all get behind. If you want to follow along this is going to be our schedule over the next few weeks, so stay tuned. Last week I showed you some ways to modify Warrior II. This week we are going to cover another challenging standing pose, trikonasana. There are a couple of general rules when it comes to doing triangle pose or trikonasana. Your goal is to make an isosceles triangle with your body...working up to placing your lower hand on the floor and your spine straight and parallel to the floor. 1. Start high up on your shin. I generally put my hand on my shin. My shin is much taller than using a block as a prop. I have issues with tilting my pelvis and my abductor strength, so I really can mess up my back if I'm not careful. Using the block forces me to go lower than I normally would, but, I do know that I eventually have to make it to the floor. Sigh. If I use two blocks and place one near the wall for my toes to go up on it forces my quad to engage in the front leg. The second block lets me go a bit lower to the floor. When you're folded sideways into Triangle, you build strength in your torso muscles, which support the weight of your spine, rib cage, and head against the pull of gravity. As you train the muscles around your shoulders to keep your arms in place, you're not only teaching yourself not to slump but also opening your chest so your lungs can expand more fully. Engaging your front leg with your toes up a block works first on strengthening the front leg. 3. Put your back foot on the wall. Once you feel your front leg is stronger, you can switch up the pose and place the back foot on the wall. For your front leg, press out through your right leg into the four corners of the foot, as though you're trying to push the mat away from the floor. This will engage your quadriceps to support your right knee - which was the purpose of using the block in modification 2. Next, place your back hand on the hip of your back foot. Inhale and, as you begin to exhale, push with your front hand so your front buttock slides back, away from your head and torso. This will initiate your pelvis tipping to the front and help you maximize the length of your hamstrings and adductors. When you feel your hamstrings and adductors stretching, reach for your block. When the leg stretch becomes intense, that's a sign you've rotated the pelvis as far as you can. The important thing here is to keep your spine straight. If you have to use a chair or two blocks, it's better to use that than to curve your spine trying to reach lower than you should. Instead of reaching for something your body isn't ready for, remind yourself that it takes years to develop the hamstring and adductor flexibility that allows you to put a hand on the floor without curving the spine. Until you can do that, use a block and work regularly on stretching your hamstrings and adductors. 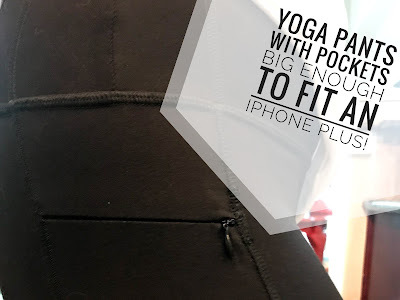 Eventually, you'll work your way to the floor without sacrificing the length of your spine. My bullet journal keeps my life in balance. 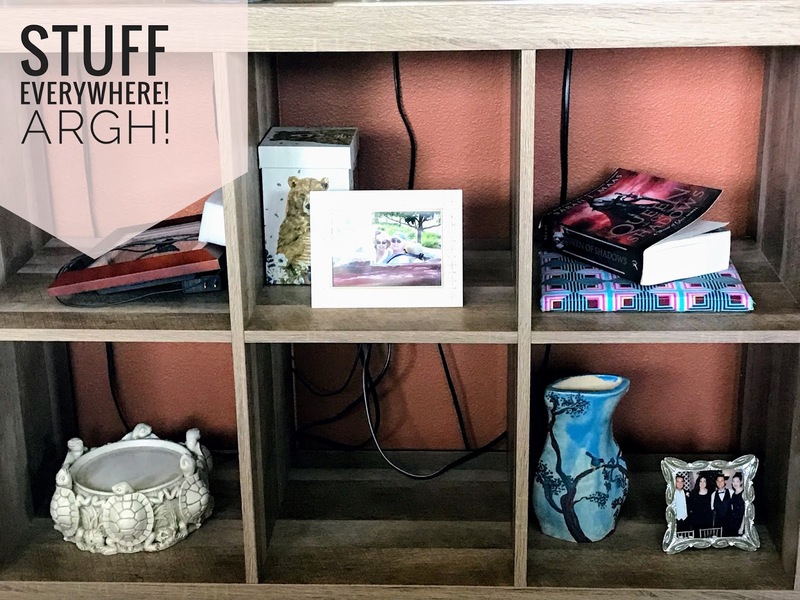 I have so much in there, from tracking my pain and energy levels, cleaning schedules, to-do lists, and even Christmas gift ideas. In my weekly spread, I try to keep certain tasks separate. If I know I'm going to devote a phone call to a Debbie Downer, I may make sure to only do one physical thing that day. If I've got company coming then maybe I skip the workout in favor of cleaning up. It's a balance, and while this seems simple, most of us are so used to flying by the seat of our pants that we don't feel we have the luxury to stop and think. It's hard to plan or think ahead if you are a seven or higher on the pain scale. That's why it's so important to keep a bullet journal. Something that I may not have mentioned in my previous posts about bujo's is the medical benefits of bullet journaling. We all know that journaling is linked to stress reduction. I argue to actually keep a physical journal, and preferably a bullet journal since it is so customizable. Since it is in 'analog' format (HA!) you are not staring at a screen. 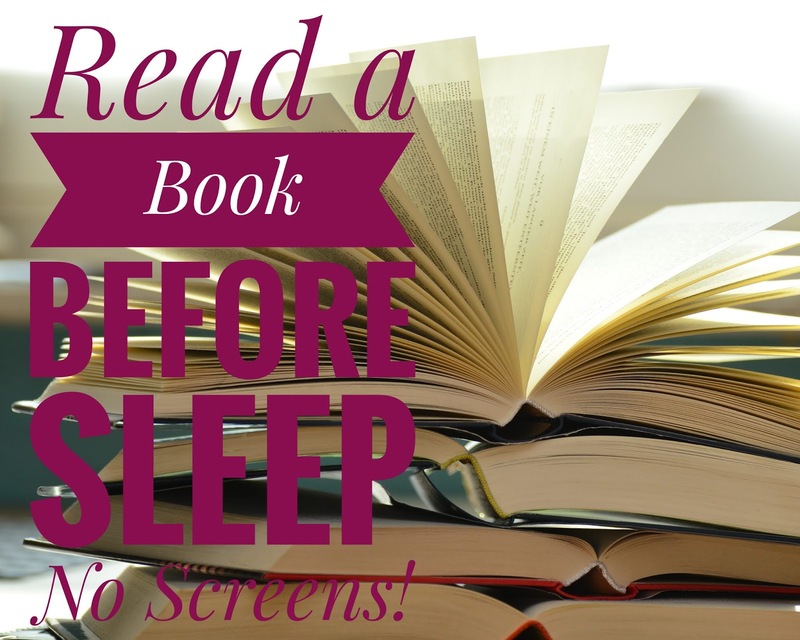 Staring at screens is not good for your health. 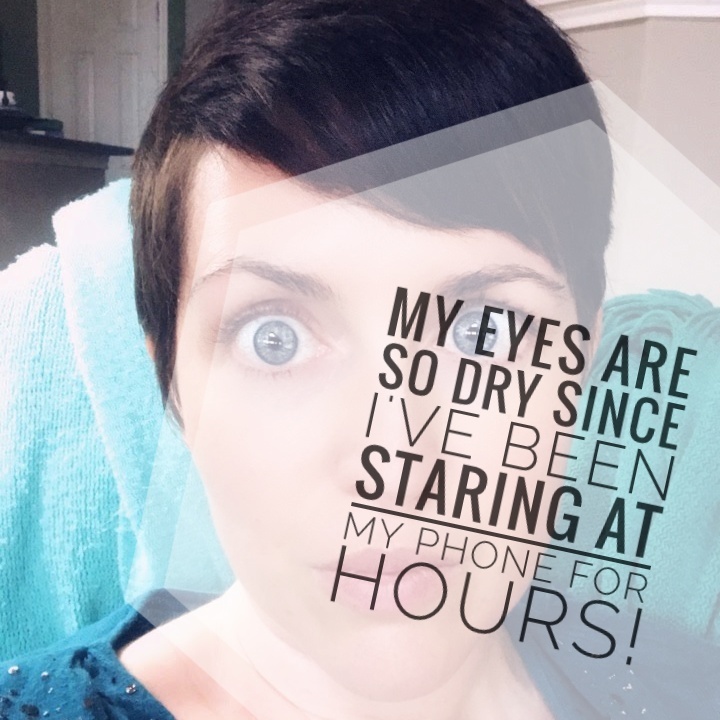 Staring at a screen for extended periods of time can cause “computer vision syndrome.” You’re probably familiar with the symptoms: strained, dry eyes, blurred vision, and headaches. Poor posture can also cause neck and shoulder pain. Studies link heavy computer and mobile phone use to more sleep disturbances. 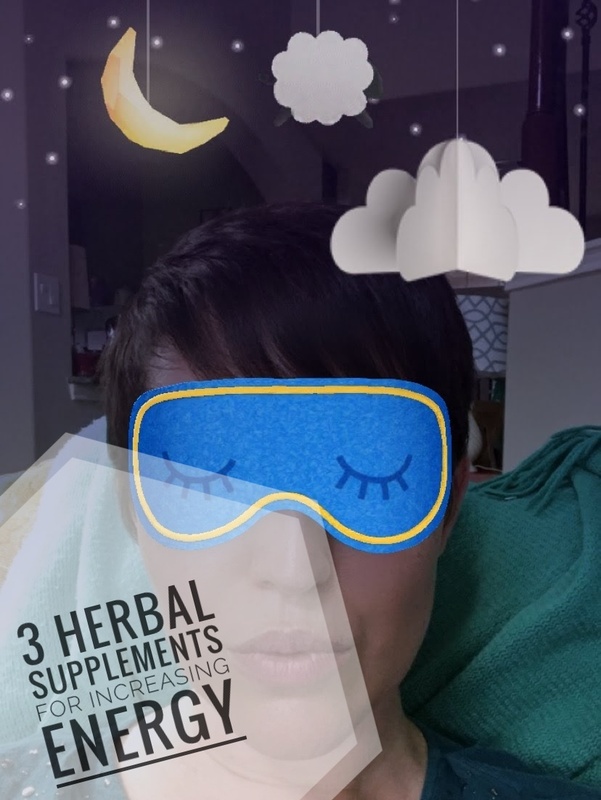 University of Gothenburg psychologist Sara Thomée, one study's lead researcher, says the blue light from digital devices suppresses the sleep-promoting hormone melatonin, keeping us from having restful sleep. Dopamine, the “feel-good hormone,” is part of the brain’s pleasure and reward circuits. Playing video games turns on similar brain regions as those linked to cravings for drugs and gambling, Ditto for social media — every time we see a new post or get a reaction to ours, it’s like a hit of brain candy. Even two hours of TV a day can increase the risk of weight gain, diabetes, and heart disease in adults. (Computer use doesn’t seem to have as strong a link.) There are probably several factors to blame, including less active time, less sleep, and seeing more ads for unhealthy foods. So keeping a journal on your phone or tablet is not a good idea. It will be too tempting to check those Facebook notifications, get sucked into hours of screen time, and have negative cerebral consequences. Handwriting helps with effective memory recall, sharper thinking, creativity, and problem solving. In fact, handwriting is defined as a complex cognitive process involving neuro-sensory experiences and fine motor skills. For a study published in Psychological Science, researchers Pam A. Mueller of Princeton University and Daniel M. Oppenheimer of the University of California, Los Angeles, showed research participants a TED Talk and told them to take notes—half of the participants on a laptop, half writing by hand. Then the researchers tested them on the information in the lecture. What they found was that while keyboard users and hand writers remembered facts, such as dates, equally well, hand writers had a much better grasp on conceptual questions. Writing things down is also permanent. It will last. 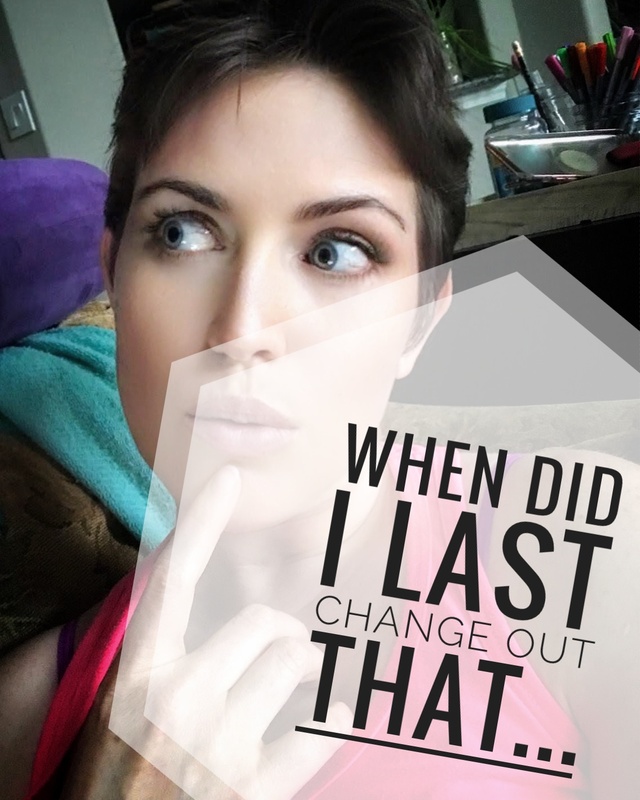 You can refer back to it in the future and that makes it easy to reflect on your growth, your goals, and your tasks. Half of 2018 is almost over but that doesn't mean it's too late to start. 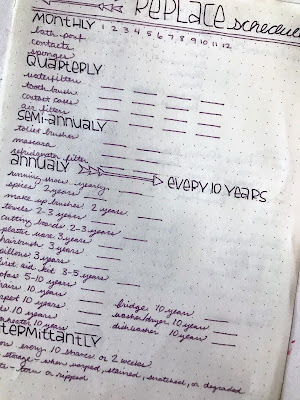 Bullet journals are flexible so they end when you run out of pages and start a new one. This could be in a few months or longer than a year. Everyone is looking for the next fix to get an edge, increase their energy, and be more focused. 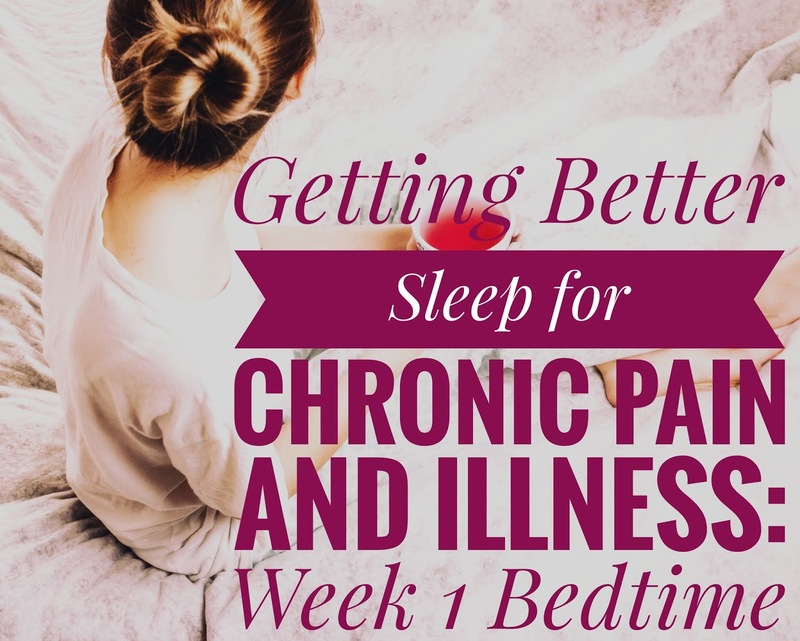 People with chronic pain and illness are simply striving to be balanced and not so fatigued (IUEV) just to keep up with the simple demands of the day. There are a lot of supplements and vitamins out there, but some things are not good for you. What you want is something that gives us energy but does not increase your appetite. The last thing you want or need is to gain weight. So if you are wondering why you're not seeing Ginko Balboa on this list, there are too many bad side effects and one of them is definitely increased appetite. I'm also not doing including things that are proven stimulants. Those can also have health consequences far-reaching than just gaining weight. For example, a course of steroids for me is great at decreasing my neuroinflammation and great for giving me energy but since they increase my appetite, I end up gaining weight, which in the long run will decrease my energy. You may have heard of Brazillian Ginseng. It's actually not a ginseng, Suma Root is the official name of this plant from South America. Suma is an adaptogen that not only increases energy but decreases inflammation and pain. It's heavy in essential minerals, amino acids, and antioxidants and has very few side effects with the main ones being nausea and stomach upset. Suma root has traditionally been prepared by crushing the roots into a fine powder, which can then be ingested with other foods or on its own, or made into tea. Recently, Suma has been developed into liquid extracts and concentrated powder capsules. People looking to benefit from Suma’s energizing, immune-system-boosting, and general adaptogenic effects are probably better off using a powdered root supplement. However, Suma also has anti-cancer, hormonal, and metabolic properties. You are more likely to achieve these beneficial results from using a liquid extract-based Suma. Sometimes called Arctic Root or Golden Root, Rhodiola is considered an adaptogenic herb, meaning that it acts in non-specific ways to increase resistance to stress, without disturbing normal biological functions. The herb Rhodiola Rosea grows at high altitudes in the arctic areas of Europe and Asia, and its root has been used in traditional medicine in Russia and the Scandinavian countries for centuries. Numerous studies of Rhodiola in both humans and animals have indicated that it helps prevent fatigue, stress, and the damaging effects of oxygen deprivation. Side effects were generally mild or moderate in severity. The most common unwanted effects were dizziness and dry mouth. Gotu Kola is an herb that is commonly used in Traditional Chinese and Ayurvedic medicine. Gotu Kola grows in the wetlands of Asia. It’s native to China, Japan, Indonesia, Sri Lanka and South Africa. The above-ground parts are used to make medicine. Also commonly referred to as Centella, Asiatic pennywort or Indian pennywort. Gotu kola contains many nutrients, which may contribute to its medicinal properties, including several B-vitamins, vitamin C and a handful of phytonutrients such as flavonoids, tannins and polyphenols. In animal studies, Gotu Kola lowered their version of cortisol (corticosterone) and increased serotonin, dopamine, and norepinephrine. Lower cortisol improves long-term memory and lowers aggression. Its active compounds were also able to decrease several inflammatory markers. Asiaticasoide, found in Gotu Kola, increased skin strength and skin collagen to better heal wounds. 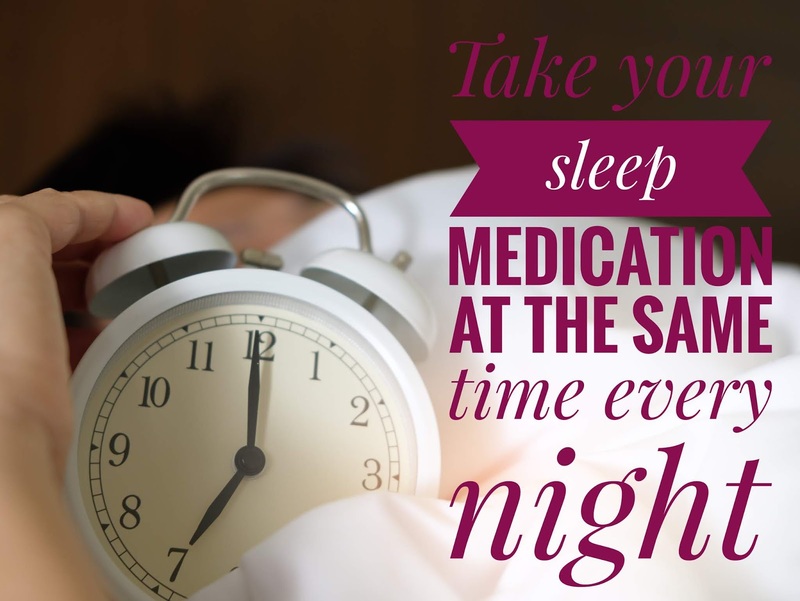 While uncommon, side effects may include headaches, nausea, drowsiness, dizziness and skin irritation. If you experience these or any other adverse reactions after taking Gotu Kola, you should discontinue use and consult your healthcare practitioner. 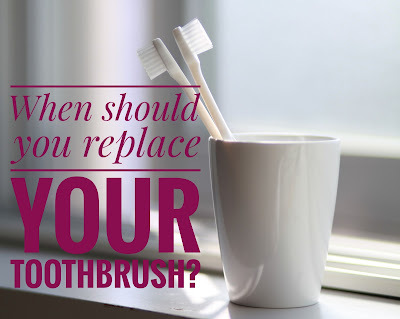 Additionally, most research advises against usage for longer than six weeks and recommends taking a two-week break if using for an extended period of time. Beef and Broccoli has always been one of my favorite things to order for takeout. However, when I found out that it's not very healthy, I stopped ordering it. Enter my favorite Christmas gift, the Instant Pot. 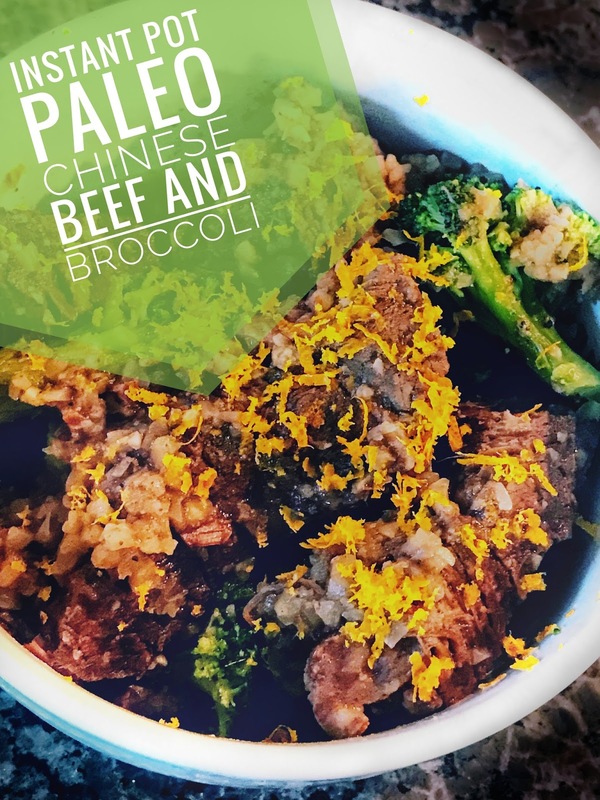 There are a lot of short rib recipes out there so after some experimenting, I came up with a great paleo version of Chinese Beef and Broccoli. Turn the Instant Pot to saute and pour in the avocado oil to heat up. 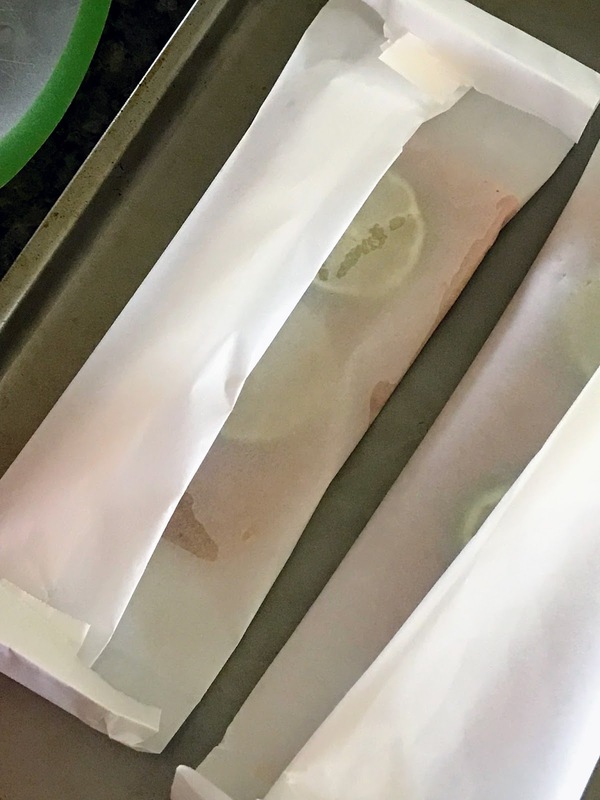 While the Instant Pot is heating, wash and pat dry the short ribs. Place in a large bowl and sprinkle with salt and the Chinese 5 Spice. Stir to coat well. When the Instant Pot is hot, brown the short ribs. 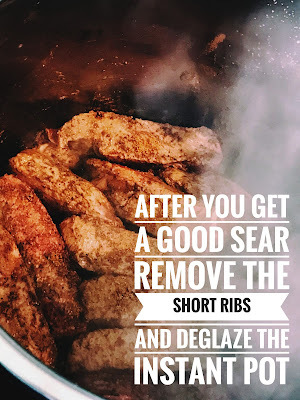 Do this in batches to get an even sear. 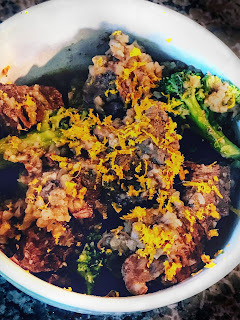 When all the short ribs have been browned, deglaze the instant pot by adding all of the liquid ingredients, including honey. Scrape the bottom to get the wonderful little bits at the bottom. Hit cancel to turn saute mode off. Load the meat back in. Top with the broccoli and then the cauliflower. Cover and set to pressure cook on high for 15 minutes. 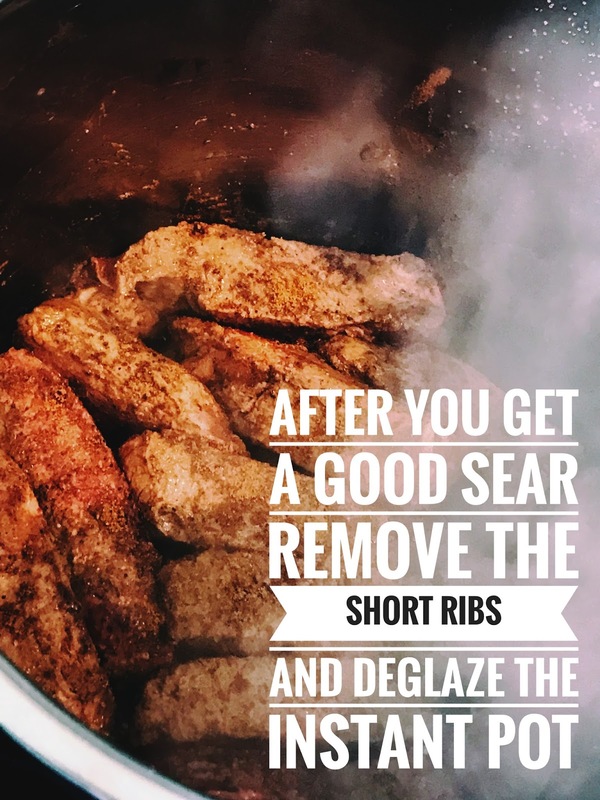 When cooking is complete, do a 10 minute natural release. Using a slotted spoon, remove the meat and veggies to a large bowl. Turn the Instant Pot back to saute and when the leftover liquid comes to a boil add the arrowroot powder. Whisk to combine well and simmer to thicken about 5 minutes. Pour sauce over meat and veggies. Serve in bowls. Enjoy! Margaritas have to be my favorite drink second to a good bottle of red wine. 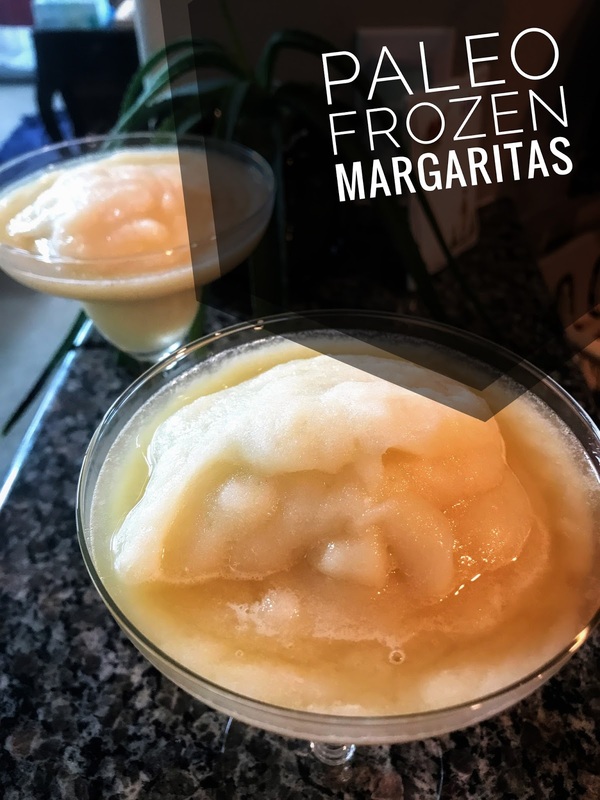 About a month after my second surgery I noticed whenever I had a margarita with friends I would get really sick, not to mention my pain went up. It was guaranteed that I'd have a pain flare from hell. So there went my favorite drink to have with special occasion fajita's. Now that it's been a few years and I've spent a lot of time modifying my diet and learning more about what helps and what hurts, I've decided to venture into the arena of making "paleo-style" cocktails. Since the national drink of Texas is a Margarita, and I love them, I obviously had to start there. Treat yo self! 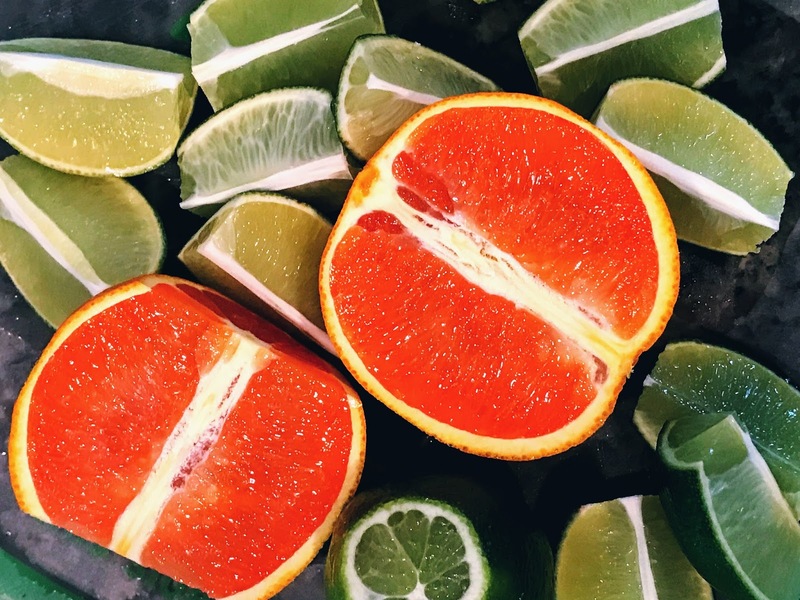 Cut the ends off the limes and orange. 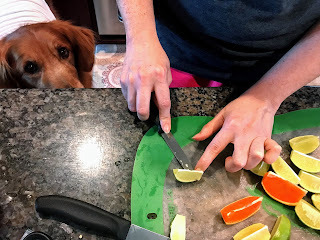 Cut the Limes into eighths. Cut the Orange in half. Save the other half of orange for another project or snack, or a second pitcher of margaritas. Remove the fruit from their peels. 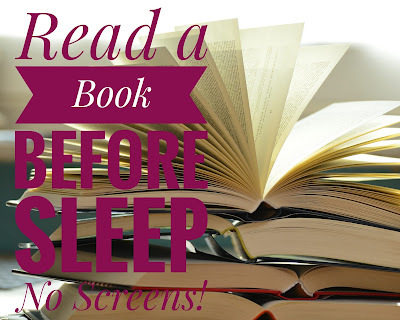 Check out how to do it in this post here. 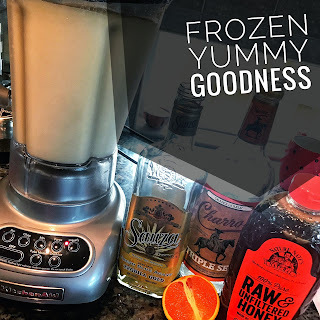 Put the fruit, honey, and alcohol in the blender and blend until thoroughly mixed. Stop the blender and add about 8 cups of ice. Virabhadrasana II or Warrior II can be a demanding pose. First, you have the slight twisting action of rotating the greater trochanter (outside lower hip) away from each other, the balancing by bending your knee, and the strength to keep your arms up. 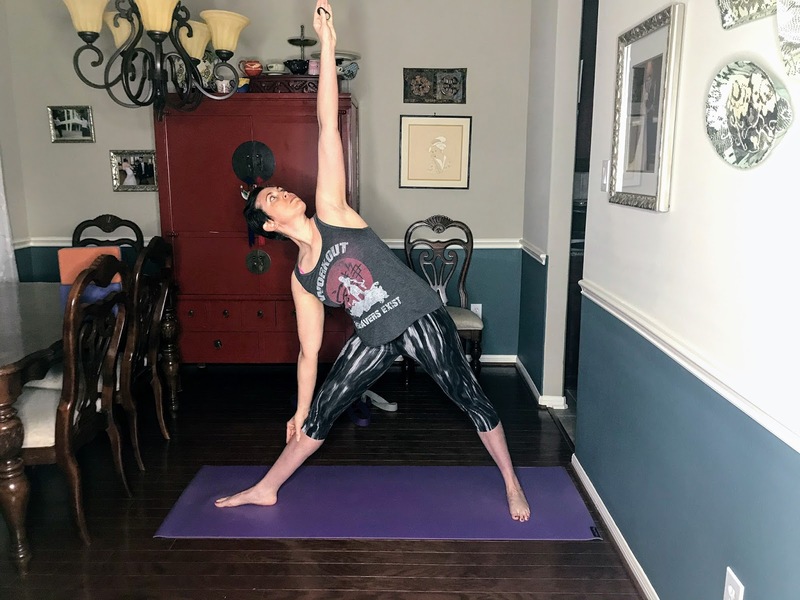 If you haven't worked out in a while or you suffer from chronic pain or illness you can't just jump into doing the pose in the middle of the room. You need to work up to it. My pointing around the legs is to remind you to turn your thighs away from each other or out. After you feel strong and comfortable with these, you can work up your time in the pose. When you can hold about a minute, cut down the time and start working in the middle of the room.